George became a PGA of Canada member in 1930 and secured his first Head Professional position at Niagara-on-the-Lake Golf Club after serving in WWII. Over his career, Clifton served as Head Professional at Maple Downs, Meadowbrook, and Pine Valley, and as a Teaching Pro at Bayview Golf and Country Club, Nottawasaga and Barrie Country Club. 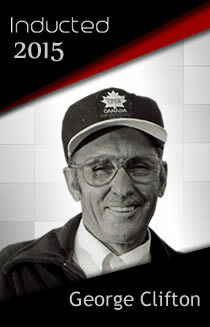 Throughout his career, Clifton served as Tournament Director for the PGA of Canada and served as PGA of Ontario President from 1956-1958. He was also honored with a number of distinctions including the 1991 PGA Teacher of the Year (co-winner), 1992 Ontario and PGA of Canada Professional of the Year Award.